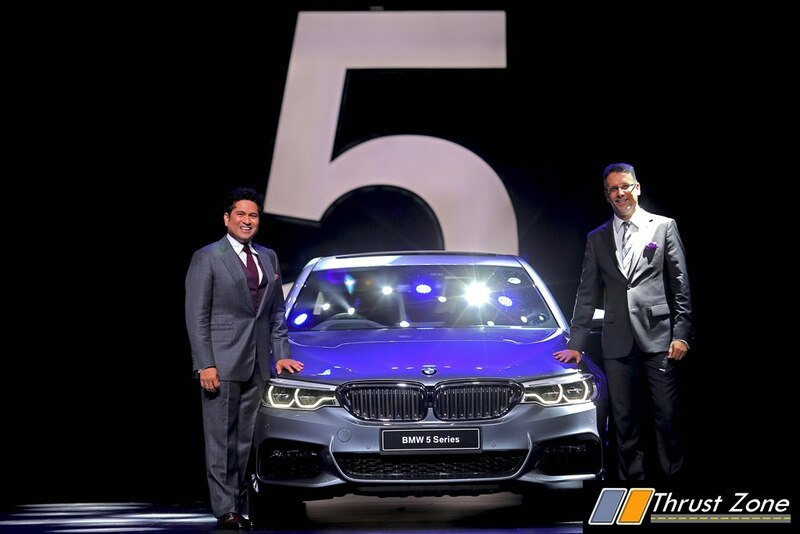 All-new BMW 5 Series was launched in India today. Seventh generation of the premium sedan was unveiled by cricketer Sachin Tendulkar. Locally produced at the BMW Plant Chennai, the all-new BMW 5 Series will be available in diesel and petrol variants at all BMW dealerships across India from 1 July 2017 onwards. Let’s talk about the variants. Sport Line stands out with many trim elements in high-gloss black, special colours in the interior, sports leather steering and light-alloy wheels in a bi-colour polished finish. The Luxury Line indulges has elements of high-gloss chrome and matching wheels, aluminium door sill plates, sports leather steering wheel, exclusive colours for the ambient lighting and chrome edging for the air vents. In the M Sport package comes with M aerodynamic package, M light-alloy wheels, M badging , an extremely sporty cockpit design with M leather steering wheel and comfort seats in the front with Exclusive ‘Nappa’ Leather upholstery as standard. The all-new BMW 5 Series comes with BMW Gesture Control, Remote Control Parking with BMW Display Key, Wireless Charging, Parking Assistant with Surround View and the next generation BMW Head up Display. There is a concept that recognizes six pre-defined hand movements for control of a number of functions. This includes volume control, accepting or rejecting phone calls, acknowledging check control messages, closing an information window, changing the camera angle etc. There is also the option of pairing a specific gesture with an personal choice of function. The smartphone holder integrated into the centre console which allows inductive, Wireless Charging for mobile phones and the BMW Display key. Ambient Lighting package with six dimmable designs is on offer. 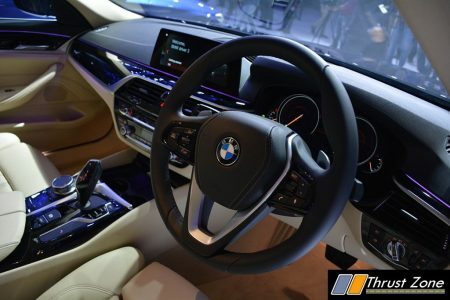 The BMW iDrive with BMW Navigation Professional (with touchscreen), Park Distance Control and Parking Assistant with Surround View Camera that provides a 360-degree view, BMW Apps, Connectivity through Bluetooth and USB/AUX IN connectivity. BMW Head-Up display in the M Sport variant of the all-new BMW 5 Series is now 70 percent larger than before. The Rear-seat entertainment Experience equipment guarantees great entertainment for the rear seats. 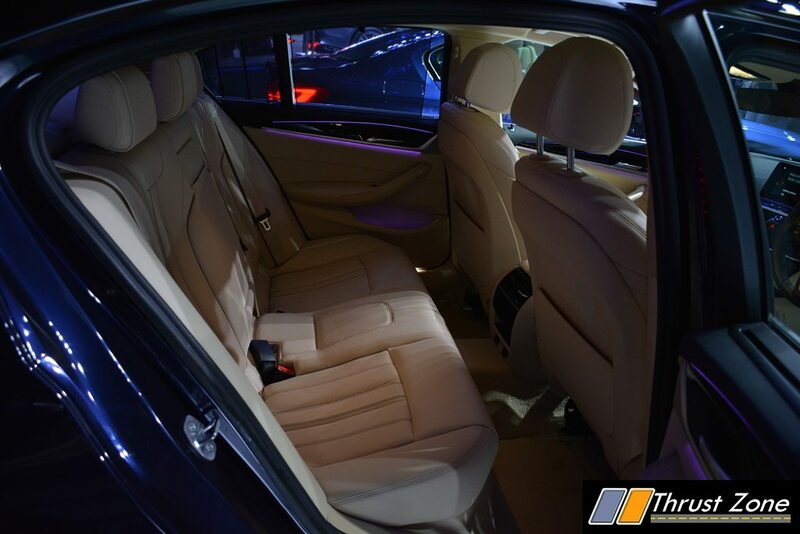 It includes two 10” colour displays on the rear side of the front seat backrests. It also includes a Blu-ray player, a HDMI connection for mobile devices, as well as various connections for MP3 players, game consoles. Up to three sets of headphones can be connected via the integrated wireless interface. The three-litre six-cylinder diesel engine of the BMW 530d produces 265 hp and a maximum torque of 620 Nm at 2,000 – 2,500 rpm. The car accelerates from 0 -100 km/hr in just 5.7 seconds to a top speed of 250 km/hr. The two- litre four-cylinder petrol engine of BMW 530i produces 252 hp and produces a maximum torque of 350 Nm at 1,450 – 4,800 rpm. The car accelerates from 0 -100 km/hr in just 6.2 seconds. The two-litre four cylinder diesel engine of the BMW 520d produces an output of 190 hp and produces a maximum torque of 400 Nm at 1,750-2,500 rpm. The car accelerates from 0 -100 km/hr in just 7.5 seconds. The eight-speed automatic transmission performs gearbox duties. The Dynamic Damper Control that improves ride quality also allows the integration of using the Driving Experience Control switch, the driver is able to choose between different driving modes to suit the driving conditions such as the Comfort, Sport, Sport+,ECO PRO and Adaptive. The all-new BMW 5 Series comes with six air bags, Anti-Lock Braking System (ABS) with brake assist, Dynamic Stability Control (DSC) including Dynamic Traction Control (DTC), Cornering Brake Control (CBC), Hill Descent Control (HDC), Side-impact Protection, Runflat tyres (RFT) with reinforced sidewalls, electronic vehicle immobiliser, crash sensor and integrated emergency spare wheel. All of this is a part of the safety kit.